Brenda Destro is the Deputy Assistant Secretary for Planning and Evaluation (ASPE). 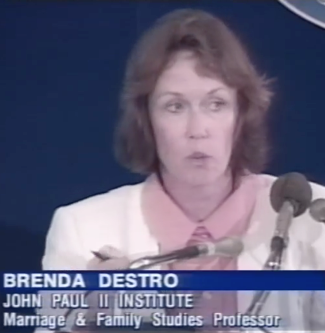 She spent many years on the faculty of the anti-abortion, John Paul II Institute for Studies on Marriage and Family. During the Bush administration, Destro served at the Department of Health and Human Services (HHS) as an Advisor to the Assistant Secretary for Health in the Office of Public Health and Science. The Assistant Secretary for Planning and Evaluation (ASPE) advises the Department of Health and Human Services (HHS) Secretary (Alex Azar) on policy development in health, disability, human services, data and science. Under Destro, the office has been accused of distorting information to push the Trump administration’s narrative, including adding anti-abortion language to the agency’s strategic plan. The ASPE additionally conducts research and evaluation studies, including the Teen Pregnancy Prevention Program. ASPE is a large office responsible for public health services including issues related to the organization and delivery of health care services, women’s preventive services and adolescent, maternal and child health. The Office is also largely responsible for human services policies regarding teen pregnancy prevention, LGBTQ youth, and vulnerable populations.